This example can easily be modified to show how to read from an Excel file. A CSVReader is created using the file path of the input CSV file credit-balance-01.csv. ExcelDocument and ExcelWriter instances are created. 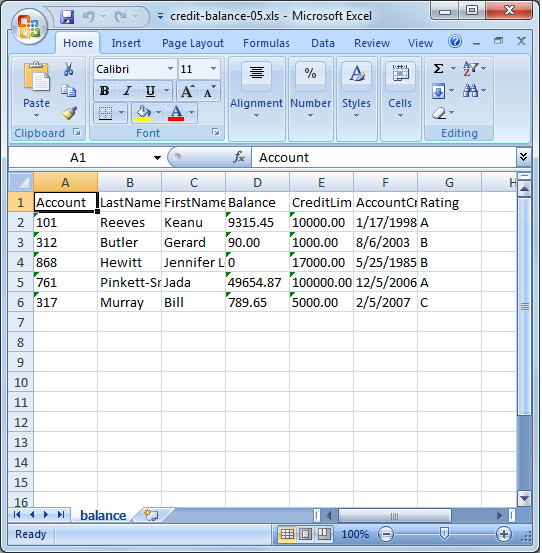 The setSheetName method is invoked to set the Excel sheet name to balance. Data is transferred from the input CSV file to the output Excel file via JobTemplate.DEFAULT.transfer method. Finally, the Excel document is saved via the ExcelDocument.save method using the file path of the output file credit-balance-05.xls. ExcelWriter is an output writer which can be used to write to an Excel file. It is a sub-class of AbstractWriter.html and overrides the open and close among other methods. ExcelDocument is a class that encapsulates an Excel document. Normally, when CSV or other types of files are written, the output file is saved via the writer itself. For ex. you can refer to the write to a CSV file example. However in the case of Excel documents, the files need to be opened/saved via ExcelDocument class. ExcelWriter is used purely for writing to the Excel file.